From transport to selfie sticks to food and drink, we’ve got all your questions covered. You’ve made it! You’ve taken action, you’ve earned your tickets, and now you’re all set to see Beyoncé and JAY-Z, Cassper Nyovest, D’Banj, Ed Sheeran, Eddie Vedder, Femi Kuti, Kacey Musgraves, Pharrell Williams & Chris Martin, Sho Madjozi, Tiwa Savage, Usher, and Wizkid. We’re very excited to welcome you to FNB Stadium on 2 December for Global Citizen Festival: Mandela 100, presented and hosted by the Motsepe Foundation. But, to make sure you get there safely, happily, and with everything you’ll need, here are all of your questions answered ahead of the Big Day! What are the most important things to bring with me? Your ticket — you have to have picked this up from Computicket before you arrive at the venue, as there will be no ticket collection at the stadium. Remember to charge your mobile phone (and take a power bank). You’ll also need cash and a debit/credit card, and appropriate clothes for the weather. It's looking like it's going to be hot so stay hydrated, bring sunscreen and a hat! Reminder: There will be no ticket collection at the venue — please make sure you’ve collected your ticket before arriving at the venue. We recommend you bring your photo ID (particularly if you’re over 18 and plan on drinking alcohol), however this won’t be required for entry if you have a valid ticket. Global Citizen Festival: Mandela 100 will take place at the FNB Stadium in Soweto, Johannesburg. This is an all-day festival! Gates open at 11 a.m. and you should 100% make sure you arrive early so you don’t miss a second of fun. People who arrive early and are in their seats between 12 and 2 PM will be eligible for ticket upgrades. Free transport updates to come! There will also be security at entrances, with all bags being searched, so the earlier you get there the less time you’ll have to wait in a queue and the less likely you are to miss your favourite act! Bags can't be bigger than 15 x 20 cm. Gold Hot Seat and Early Entrance VIP packages can enter from 10 a.m. Heads up, though: Camping overnight outside the venue won’t be allowed. And you are at risk of having your ticket confiscated if you refuse to leave the area when asked by security. You can get to the venue by bus, train, car and taxi. Everything you need to know about getting to the venue can be found here. And how do I get into the venue once I’m there? Enter through the dedicated express lane at Gate K and proceed to turnstile 19 & 20 where you’ll find the VIP check-in. Enter through the marked standing entrance marquee on Landbou Road on the east side of Johannesburg Expo Centre and proceed to the dedicated express lane at Gate G where you’ll find the VIP check-in. Please enter through the marked standing entrance marquee on Landbou Road, on the east side of Johannesburg Expo Centre and head to Gate G.
You’ll need to swap your ticket for an armband to access the field after entering the venue. If you’re under the age of 12, or under 1.2m in height, you aren’t allowed in the standing areas for your own safety. If you don’t meet these requirements, you’ll be relocated to a seated area. 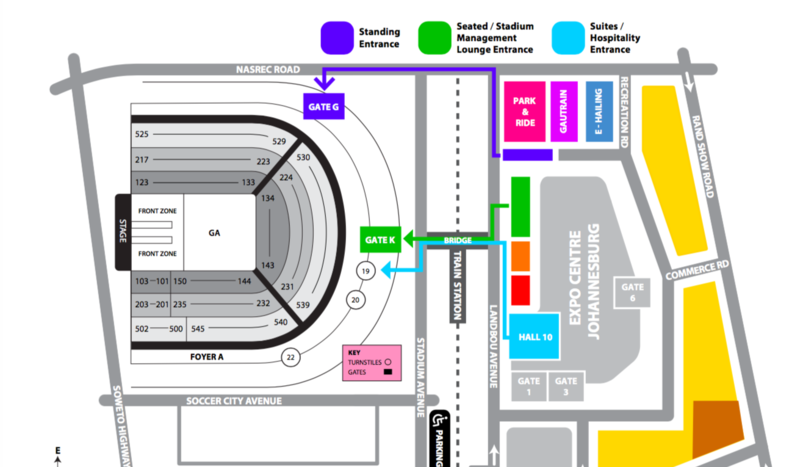 Please enter through the southern side bridge from the Nasrec Transport Hub, and go to Gate H and Gate K.
Parking for suites and hospitality ticket holders has been allocated at Gate 6 on the south side of Johannesburg Expo Centre. Proceed to Hall 10 for searching and walk to the dedicated express lane at Gate K from where you will be directed to turnstiles 20 to access the venue. What do I need to know about accessibility? Spaces for wheelchair users can be booked via the Computicket careline on 0861 915 8000. If you require disabled parking, please send an email to customercare1@bigconcerts.co.za prior to the event to request your vehicle access pass. To repeat, you should definitely bring your ticket, your ID, a fully-charged mobile phone, cash and a debit/credit card, and appropriate clothes for the weather. If you’re bringing a bag, it has to be a small one, so 15cm x 20cm or less in size. You’ll only be allowed to bring one bag into the venue, and all bags will be searched at the entrance. Any bags that aren’t permitted inside the stadium will be confiscated by security if you don’t make arrangements to store them. Any confiscated items will be handed over to SAPS. Please be aware that any items that are confiscated from you won’t be returned to you — you can find out more about what items won’t be allowed in the stadium below. There won’t be any storage provided by the venue, so your belongings are solely your responsibility. Can I bring my ticket on my phone? No, tickets have to be physical tickets. There won’t be ticket collection at the venue, so you need to pick up your ticket before arriving at the stadium. Will there be food and drink available on sale? Yes, food and drink will be on sale inside and outside the stadium — but no food or drink will be allowed into the venue with you. Please make sure you bring your ID to the stadium if you’re planning on drinking alcohol and eat a good breakfast before you set off! No food or drink will be allowed into the venue — however food and drink will be available to purchase in the stadium. Sharp objects (excluding sunglasses, prescription or reading glasses, binoculars). Skateboards, scooters, roller blades, or bicycles. Knives, weapons of any nature, or fireworks. Objects of any kind that could be used to distract, hinder, or interfere with any performer (including laser pointers and flashlights). Flags, banners, or other objects that could obstruct the view of other people. Whistles, vuvuzelas, horns, musical instruments, loud hailers, or public address systems. Professional cameras, tablets, video recorders and digital, electronic, or other recording or broadcast devices. Items that you intend to distribute, hawk, sell, offer, expose for sale, or display for marketing or promotional purposes. Animals, apart from authorised guide/companion dogs. Dangerous goods of any kind and any other items by management to be dangerous or capable of causing a public nuisance. Umbrellas, braais, camping chairs, cooler boxes, or open fires. Items deemed to be offensive. Amnesty bins will be placed at all entrances. Prohibited items can be placed within these bins prior to entering the search points. The amnesty bins will be removed and confiscated by the SAPS. Is re-entry allowed into the venue? No, once you’ve left the venue you won’t be able to get back in. Global Citizen Festival: Mandela 100 is an all day festival. What else is there to do at the stadium? There will be a number of Global Citizen partner-led activities that you can get involved in, from taking actions to taking pictures, playing games, and more! How old do I have to be to come to the festival? All children attending the festival must have a valid ticket. All children under 14 must also be accompanied by a responsible adult. No children under the age of three are allowed to attend. For safety and security reasons, no one under 12 years old, or anyone shorter than 1.2 metres, will be let into the Golden Circle and General Admission field standing areas. Security will be monitoring this, and anyone not meeting these requirements will be relocated to alternative seats in the stands. If you refuse to be relocated we reserve the right to confiscate your event ticket. If you don’t meet these height or age requirements, please contact Computicket before show-day to swap your tickets for seated tickets. If I’m under 18, can I attend without an adult? People who are over 14 years old can attend without an adult. But if you’re between 14 and 18 and you’re not accompanied by a parent or guardian, please make sure you have an emergency contact number for your parent or guardian saved in your phone under ICE (meaning “in case of emergency”). If you don’t have a mobile phone, or you’re worried your phone will run out of battery, please write this emergency contact information on a piece of paper and keep it safely on you at all times. It should include your name and surname, the name and surname of your parent or guardian, and how to contact them in an emergency in bold capital letters. We also recommend parents of minors who will be attending unaccompanied to educate their children about potential inherent dangers. Don’t talk to strangers; accept food or drink from strangers; and don’t get in a vehicle with anyone you don’t know. If you find yourself in a situation where you feel uncomfortable, approach the nearest Security or Security Steward, or call 011 247 5300 for assistance. What happens if I lose something, or someone? If you lose something or someone, there’s a Lost & Found Hub inside the venue, at Foyer U — east of the stadium at Turnstile 15. If you need to contact the Lost & Found Hub, you can call 011 247 5300. That number can be used for all incidents, queries, and emergencies, and will be available during and after the event. There will also be a Connection Hub at the Nasrec Transport Hub to the south of the stadium, over the bridge on Landbou Road. That hub is for anyone outside of the venue who needs to reach people inside, or if you’ve already left the venue and need to reach someone inside. After the show, anyone still waiting at the Lost & Found Hub will be escorted to the Connection Hub, where they can wait in a secure environment to connect with their ride home. Security, safety stewards, emergency services, SAPS, and organisers won’t leave the stadium until everyone has left safely. The main thing you should do is stay calm. The stadium will be fully staffed with trained security personnel, and SAPS will be there, too, alongside emergency services and safety stewards. In the case of other types of emergencies, know where your nearest exit is, and follow the instructions you’re given by staff, organisers, and emergency personnel. Check out our social media channels for on-the-day updates, and for any queries. You can find us on Twitter @GCMandela100 and on Facebook here.